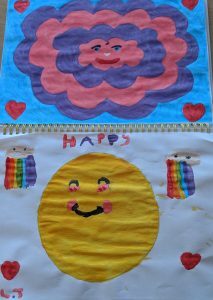 We had so much fun learning about emotions as our first topic in our home school. 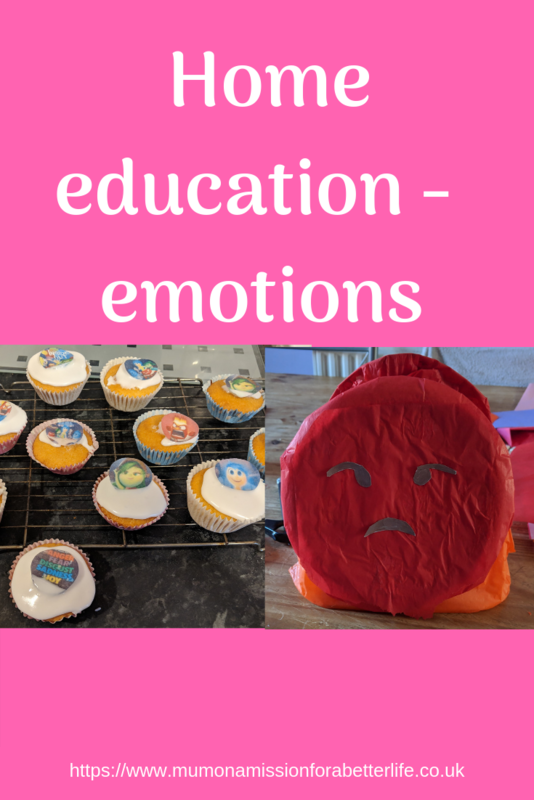 I think that we did almost all of the ideas from the list I wrote – 13 Emotions lesson ideas. As it was our first topic we took longer than I will normally spend on a topic, as I think that normally, I will spend four weeks per topic. So, we learned spellings which related to emotions and we acted out different emotions which lead to some excellent discussions about how we can feel in different situations (English, Drama, Social). 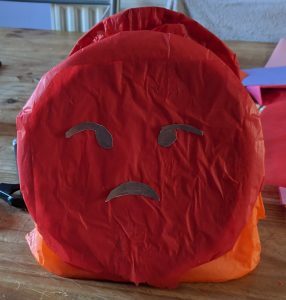 Instead of making a worry box, we made an anger box. 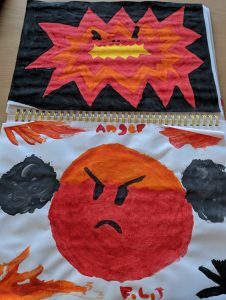 FJ often struggles with her anger so we thought that it would be a good way to help her. The idea is, that when she feels angry or upset, she writes down what has made her angry and anything else that she would like to express and then posts it into the box (Art, Social). Once a week we sit down and look at what she has posted. I talked to FJ about being honest when writing down her feelings. We have agreed that I will not be angry or judgemental about anything that she has written as they are her feelings and they are valid as they mean something to her. Then we discuss the thing that made her angry and she comes up with ideas of how to avoid it happening again or how she can cope with it should it happen again. We made a collage of happiness, where FJ cut up old magazines. Then we wrote words in bubble writing so that we could colour them in. 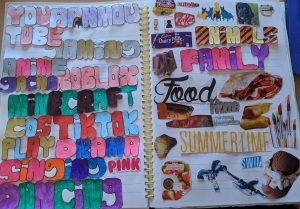 The collage has all of the things that make FJ feel happy (Art, Social). 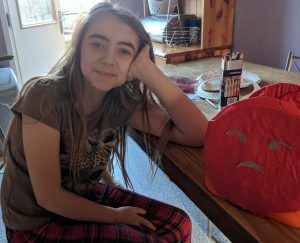 We made a scream box (inspired from this post which we found on Pinterest). If FJ feels out of control and as if she wants to scream she can use the scream box to get rid of all of her angry energy by screaming away (Art). We also decorated a box which is now FJ’s calm box. FJ has put things in the box which will help her to calm down when she is feeling angry or upset. There is a pot of slime, a squishy, some fidget spinners, a stress ball, and some colouring pencils with some ‘colour in’ print off’s (Art, Social). We talked about how feeling angry and worried about things can also be called ‘stress’ and how stress can impact the body. FJ researched both short term and long term effects on the body from stress and then wrote them onto body shaped parts. We then drew around FJ so we had a body to stick the parts too (Biology, English, Art). For example, we drew a brain shape and then wrote headaches inside it. We then stuck it onto the head of our body. This was a really fun way for FJ to learn about the effects of stress and they have really stuck with her as well. In my opinion, much more than if she had just written them down in a textbook. We talked about ways to reduce stress and stay healthy, one of which was exercise and yoga. We then had a go at the ‘cosmic yoga‘ which we found on youtube. 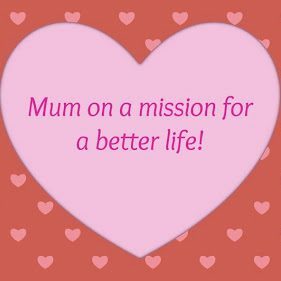 I tried it after it was recommended on some of the home education groups which I am a member of on Facebook (PE, Social). I had not viewed it until we put it on to do and I was really worried at first as it seemed like it was aimed at much younger children. FJ is 11 now so I thought that she would be annoyed at me. We chose a pokemon themed one as FJ likes pokemon. FJ surprised me as she really got into it and especially enjoyed telling me the things about pokemon that the lady had gotten wrong! When it had finished, FJ asked if we could do another one, so we did a Minecraft version as well. Since then FJ has asked a few times if we can do some more, so she definitely enjoyed it! 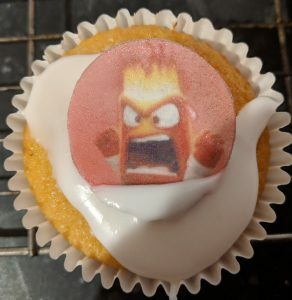 We ended the topic by making some Inside Out cakes and watching the film Inside Out. 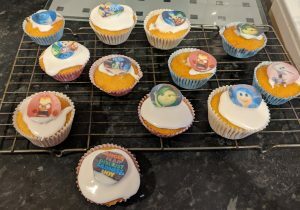 I used my basic cake recipe and then topped with icing and some inside out sugar paper toppers which I brought on eBay. We had seen the film before but not for a long while so it was nice to watch the film together and eat the cakes which we had made (Cooking). All in all, we had a great time learning about different types of emotions and it brought us closer together, so this was a fantastic start to our home school journey. If you do any of these ideas for your home school learning, or just for fun if your children attend school, I would love to hear how you got on?